The annual Green Commute Week competition is a great way to bring your office together! 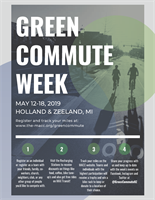 Throughout the week (May 12-18), teams in the Holland/Zeeland area choose "green" transportation options when commuting to work or running errands within our community. The team with the highest participation in their category will be declared the winner and receive a trophy and an outdoor bike rack that can be kept or donated to a location of their choosing (mileage will be used as a tie-breaker). Alternative modes of transportation can benefit the environment, the budget, and personal health. Since the start of the competition back in 2011, participants have racked up over 87,000 Green Commute Miles! Learn more and register your team at www.the-macc.org.